OutBack Power's new MATE3s display and controller offers advanced features for monitoring and controlling your OutBack Power system. Remotely manage and monitor multiple inverter/chargers, and DC monitoring devices with this well designed controller. The MATE3’s intuitive user interface and integrated system configuration wizard make programming and setup simple and straightforward. 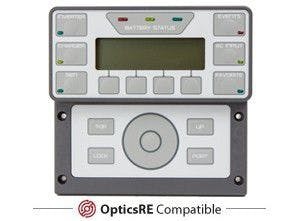 The OutBack MATE3s controller’s unique multi-level password feature allows you to secure critical system settings from unintended changes while still allowing open access to necessary functions. A built-in clock and calendar function allows for detailed timer-based programming of inverter and charger operation. Settings are stored in permanent memory to preserve settings in the event of system shutdown. 80 MHz 32 bit microprocessor. User-friendly interface with large graphical display. 5 navigational keys & scroll wheel with intuitive menu structure.